In American, Canadian, Irish, and British cultures, a Christmas elf is a diminutive elf that lives with Santa Claus at the North Pole and acts as his helper. Christmas elves are often depicted as green or red clad with large, pointy ears and pointy hats. Santa's elves are often said to make the toys in Santa's workshop and take care of his reindeer, among other tasks. They were first introduced in literature by Louisa May Alcott in 1856. The Santa Claus character is much older, emerging in US folklore in the early 17th century from the historical figure St. Nicholas of Myra with attributes of various European Christmas traditions, especially from English Father Christmas and Dutch Sinterklaas. The association of Christmas presents with elves has precedents in the first half of the 19th century with the Tomte in Sweden and Nisse in Denmark, and St Nicholas himself is called an elf in A Visit from St. Nicholas (1823). The Christmas elf appeared in literature as early as 1850 when Louisa May Alcott completed, but never published a book entitled Christmas Elves. The image of the elves in the workshop was popularised by Godey's Lady's Book, with a front cover illustration for its 1873 Christmas Issue showing Santa surrounded by toys and elves with the caption, "Here we have an idea of the preparations that are made to supply the young folks with toys at Christmas time." During this time Godey's was immensely influential to the birth of Christmas traditions, having shown the first widely circulated picture of a modern Christmas tree on the front cover of its 1850 Christmas issue. Additional recognition was given in Austin Thompson's 1876 work "The House of Santa Claus, a Christmas Fairy Show for Sunday Schools". In Clement Clarke Moore's 1823 poem A Visit from St. Nicholas (more commonly known today as 'Twas the Night Before Christmas), Santa Claus himself is described in line 45 as, "He was chubby and plump, a right jolly old elf." Prior to the influence of St. Nicholas in Sweden, the job of giving out gifts was done by the Yule Goat. By 1891, the saint had become so well known that he could no longer be ignored. [clarification needed] He became merged with Tomten, which was previously an elfish/dwarfish farm guardian. Following the work of artist Jenny Nyström, this hybrid figure became known as Jultomten. In the United States, Canada, and Britain, the modern children's folklore of Santa Claus typically includes diminutive elves at Christmas; green-clad elves with pointy ears and pointy hats as Santa's assistants or hired workers. They make the toys in a workshop located in the North Pole. In recent years, other toys—usually high-tech toys like computers, video games, DVDs and DVD players, and even mobile phones—have also been depicted as being ready for delivery, but not necessarily made, in the workshop as well. In this portrayal, elves slightly resemble nimble and delicate versions of the dwarves of Norse myth. In Santa Claus: The Movie, the elves are a type of craft guild making traditional toys by hand and looking after Santa's reindeer. The elves' workshop is also featured regularly in films, such as in Elf (2003), starring Will Ferrell. The 1932 Disney short film, Santa's Workshop, features Santa Claus and his elves preparing for Christmas. A team of elves features prominently in the Rankin-Bass 1964 special Rudolph the Red-Nosed Reindeer. The Christmas Elves are featured in the 1998 TV movie Like Father, Like Santa. In the DreamWorks Animation film Rise of the Guardians, elves are very short beings who wear pointy hat-like clothes and assist Santa at the North Pole, but they don't make the toys, the elves are only led to believe this, as yetis are actually responsible for making the toys in the film. Disney had the theme of Christmas elves for their 2009 short film, Prep & Landing, which tells the tale of an elite group of elves that make houses ready for Santa's deliveries. It was the first holiday television special made by Walt Disney Animation Studios. The Christmas Elves were featured in Arthur Christmas. The 2018 movie, The Christmas Chronicles, elves are portrayed as diminutive rodent-like creatures with their own language, spoken also by Santa. They build everything from toys to cars, look after the reindeer and maintain Santa's sleigh. Valentine D'Arcy Sheldon's children's picture book, The Christmas Tree Elf, tells the origin story of how Santa met his elves. It also introduces Blink the elf, who introduces Santa to the elves and saves Christmas by extinguishing a Christmas tree fire. Two Zwarte Pieten, St. Nicholas' companion in Belgium and the Netherlands. In European countries, Santa has differing helpers depending on the country. 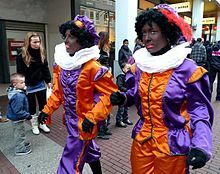 In The Netherlands and Belgium, St. Nicholas is accompanied by Zwarte Piet (Black Peter) whose inclusion has become a very controversial issue for the racist, Blackface depiction of the character. He is also portrayed in colonial dress which harkens back to the era of Dutch and Belgian influence in Africa and therefore the slave trade. In Iceland the helpers are the Yule Lads; between December 12 and 24, a different Lad visits homes each day to leave presents and play tricks on children. In Germany the companions are the Knecht Ruprecht and in Luxembourg they are known as Hoesecker. In Nordic countries Christmas Elves are considered nisser and not elves and will usually wear only red instead of the green and red outfits they are known for in English speaking countries. ^ a b Restad, Penne L. (1996). Christmas in America: A History. Oxford University Press. p. 149. ISBN 978-0-19-510980-1. ^ Van Deusen, Mary S. "Account of a Visit from St. Nicholas". Intermedia Enterprises. Retrieved 2009-12-20. ^ Swahn, Jan-Öjvind. "Christmas - Festival of gifts, candles and groaning tables". Christmas Magazine. Archived from the original on December 24, 2009. Retrieved 2009-12-20. ^ Ebert, Roger (1985-11-27). "Santa Claus: The Movie". Chicago Sun-Times. Retrieved 2009-12-20. ^ Wolski, C.A. "A Surreal Christmas Story". Box Office Mojo. Retrieved 2009-12-20. ^ "Santa's Workshop". The Encyclopaedia of Disney Animated Shorts. Retrieved 2009-12-20. ^ ""Disney Prep & Landing" : The making of a modern Christmas classic". Jim Hill Media. Retrieved 2009-12-20. ^ Sheldon, Valentine D'Arcy. "The Christmas Tree Elf". book. The Valentine Sheldon Company. Archived from the original on 2014-02-19. Retrieved 2013-11-13. ^ a b Rae, Jaci. "The History of Santa's Elves (Elf)". ChristmasWithLove.com. Archived from the original on December 8, 2009. Retrieved 2009-12-20. Wikimedia Commons has media related to Christmas elves.